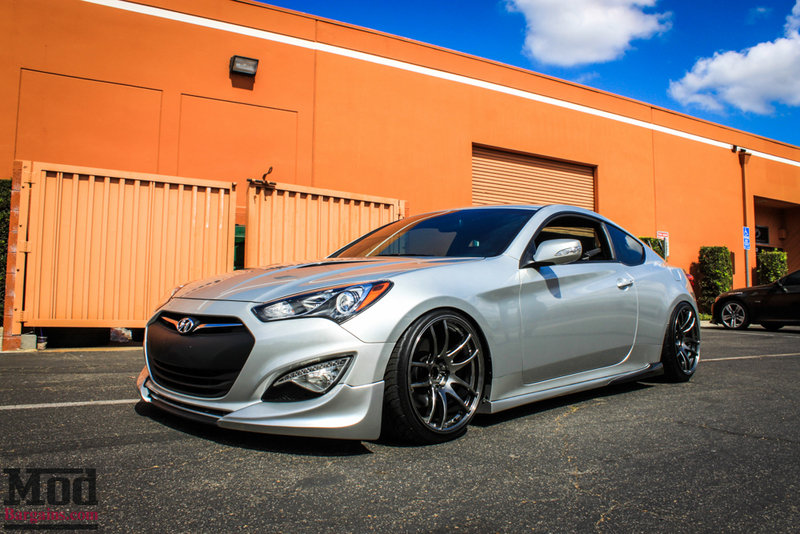 It’s not often we see modded Genesis Coupes these days, particularly not any as clean as Davis Y’s 2013 Genesis Coupe 3.8. 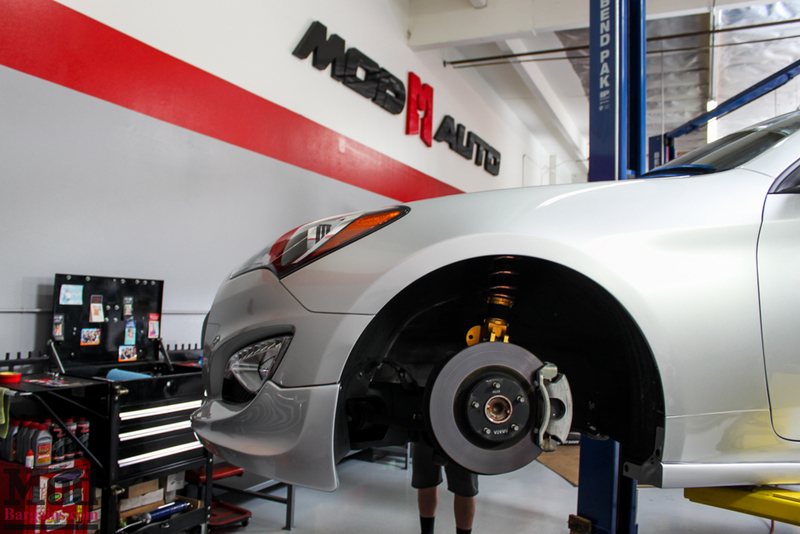 Davis was having a bit of trouble getting his Genesis Coupe Wheels balanced properly, so a trip to the Mod Auto shop was in order. 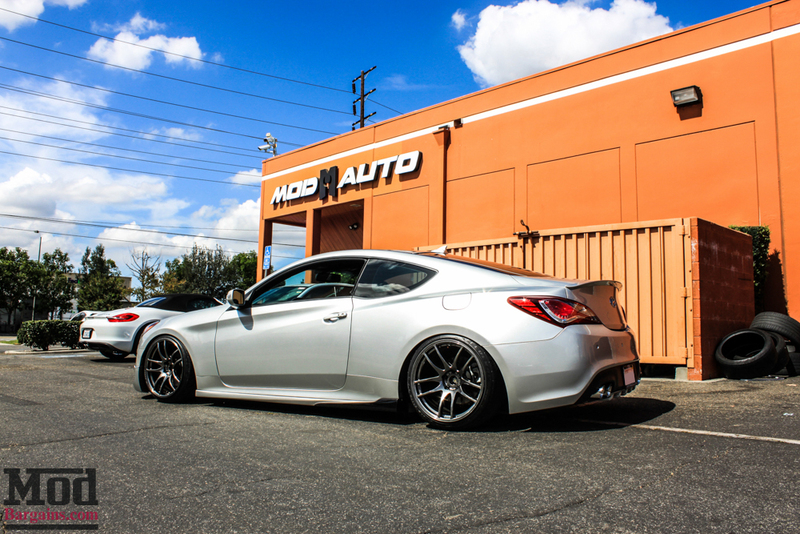 We got Davis’ GenCoupe into the shop so we could rebalance the wheels using our precision, top-of-the-line Hunter GSP9700 Road Force Balancer, which balances wheels and tires far more accurately than the equipment in your average corner “tire shop”. 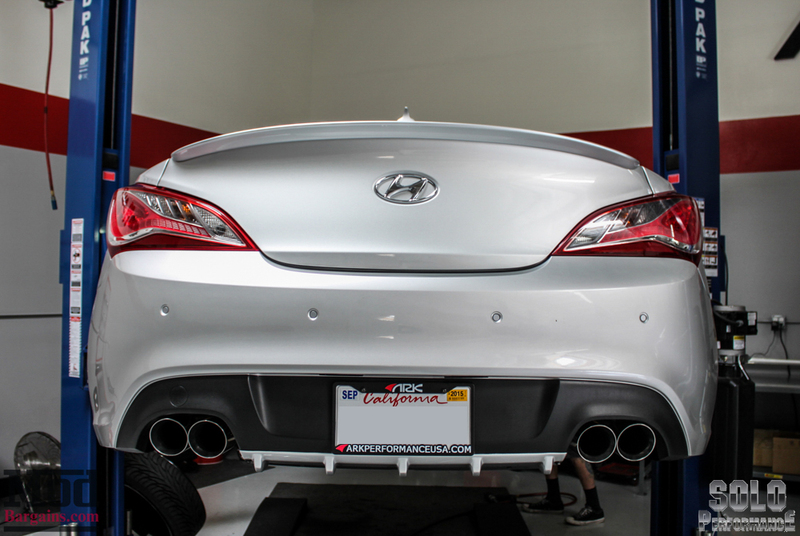 With a Sequence Rear Diffuser and a Solo Performance Catback Exhaust for Genesis Coupe 3.8, the rear profile of Davis’ modded Genesis Coupe is both clean and at the same time, very distinct. 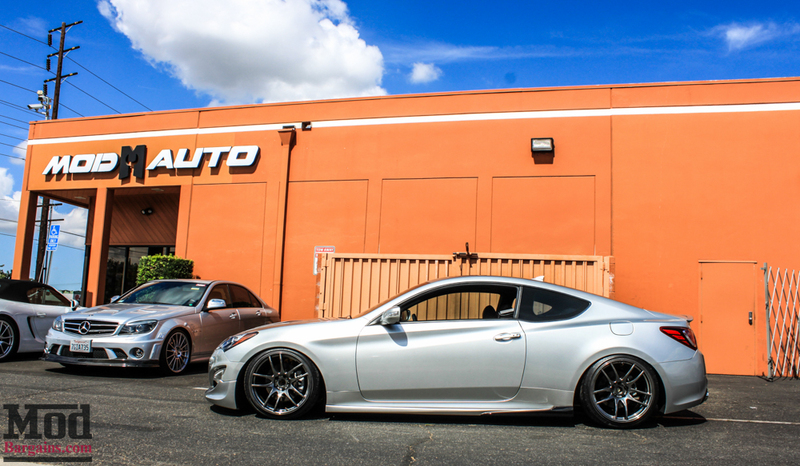 Rolling on a set of PS MAX Coilovers, the Genesis Coupe Suspension is much improved over stock. The front fenders have also been rolled to accommodate the lowered stance. 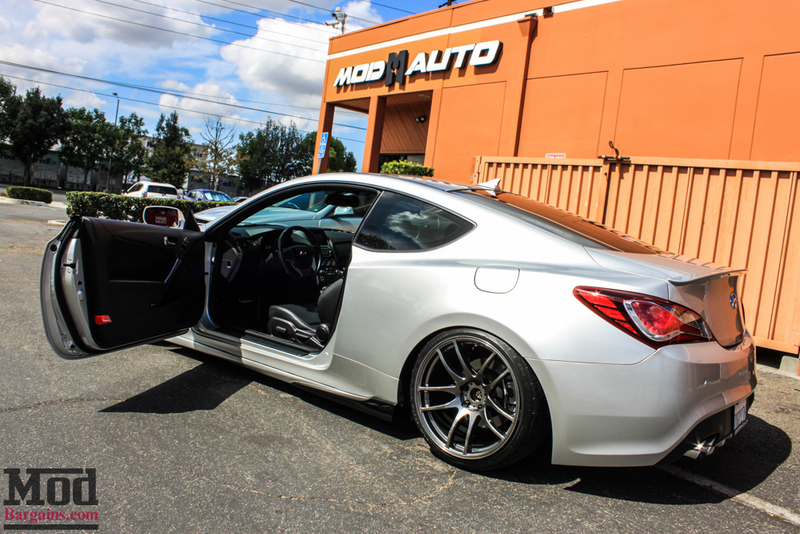 After we got Davis’ wheels dialed in, we reinstalled them and pulled the GenCoupe back into the sun to get a better look in the light. 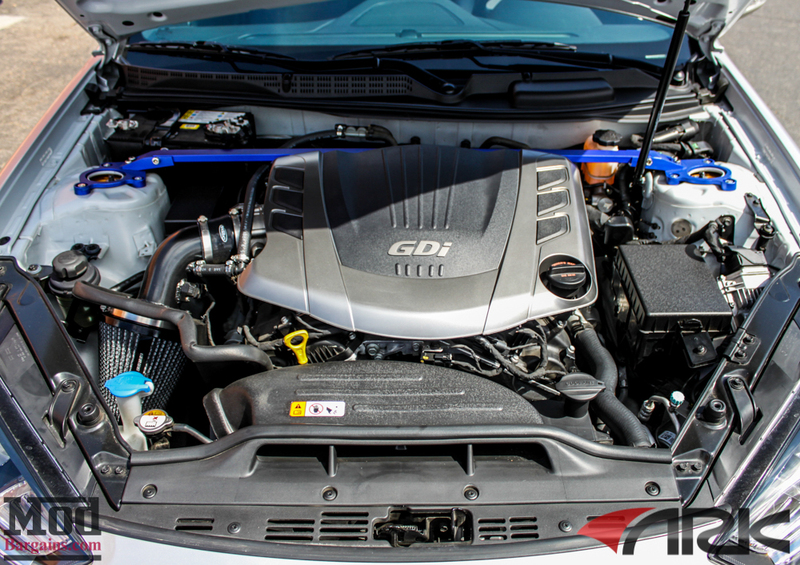 Under the hood, a R2C Cold Air Intake for Genesis keeps the 3.8 V6 fed and a beefy ARK Performance Strut Tower Brace to eliminate any movement in the shock towers under hard cornering. 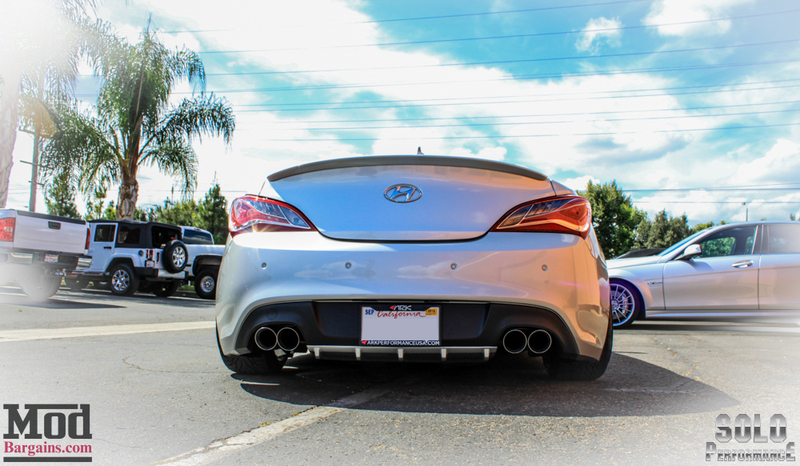 In addition to the Sequence Rear Diffuser, a set of Sequence style Side Skirts really enhance the side profile of the Genesis Coupe – the side skirts aren’t available from Sequence anymore, making the combination that much more unique. Here’s a shot of the rear straight on. 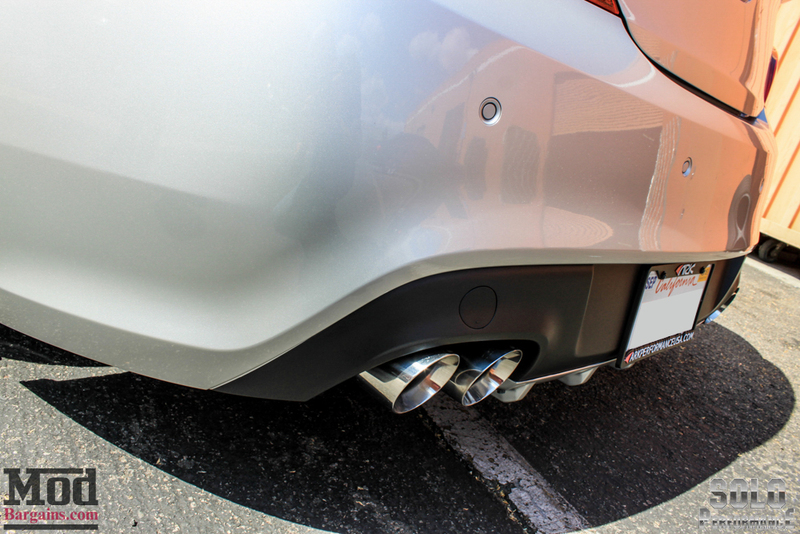 Though we didn’t install it or any of the other upgrades, we have to say, the Solo Performance Catback Exhaust for Genesis Coupe fills the rear valance openings quite nicely with the quad staggered polished tips. 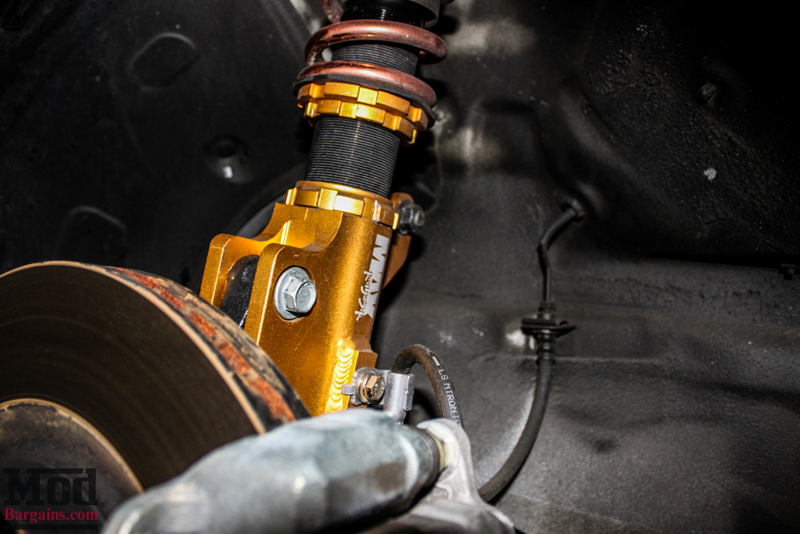 Despite running a rather stretched setup, somehow, it looks right on the car and clears the fenders both front and rear (and as we said, the front fenders are rolled). 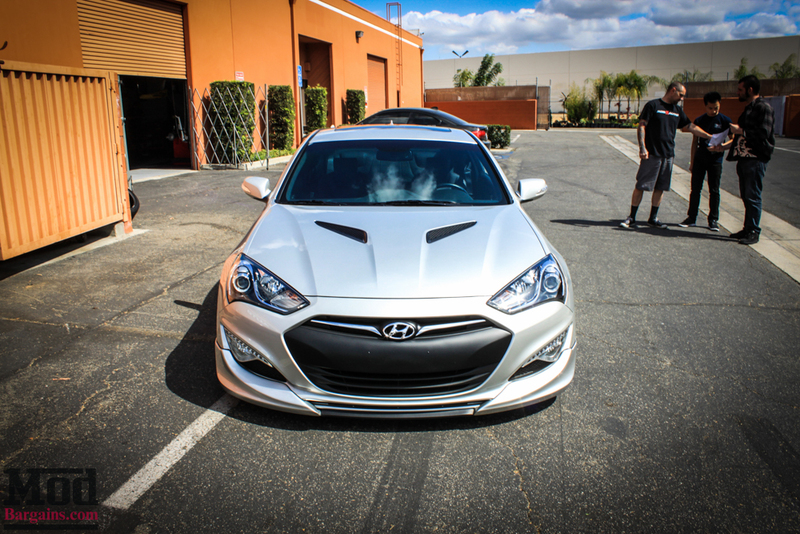 Up front, a 2-pc Front Splitter from Sarona Design gives the Genesis Coupe Exterior an even better look than the facelift did. 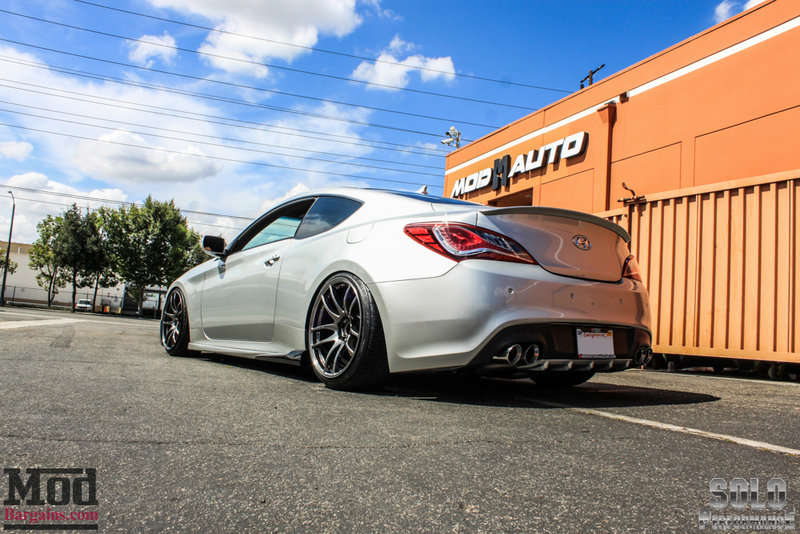 A front lip really cleans up the look of the GenCoupe. 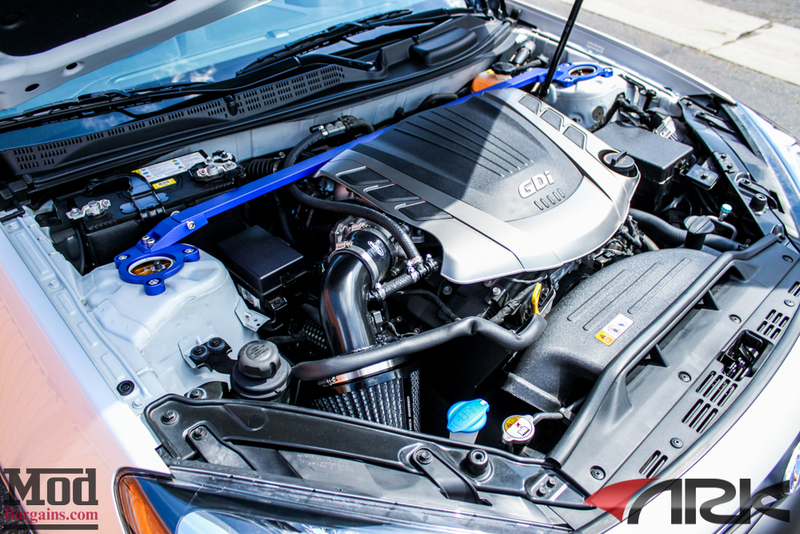 Here’s a closer look under the hood. 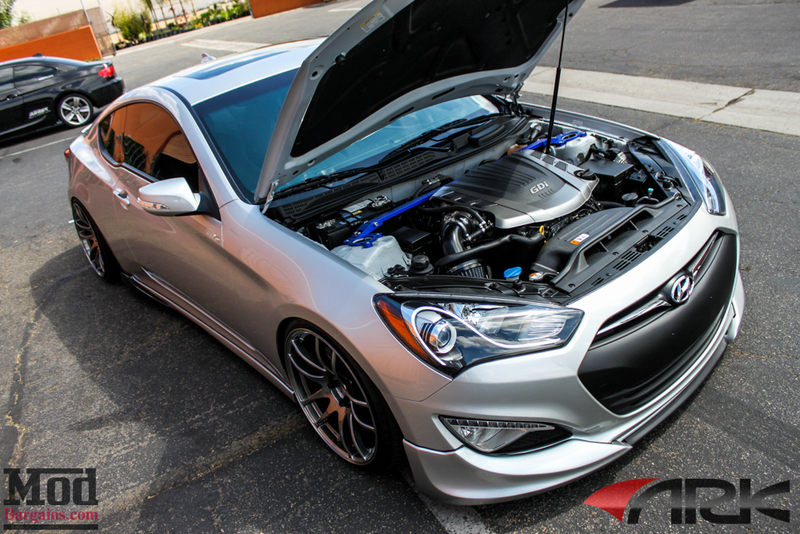 Here’s a closeup of the Genesis Coupe Intake. 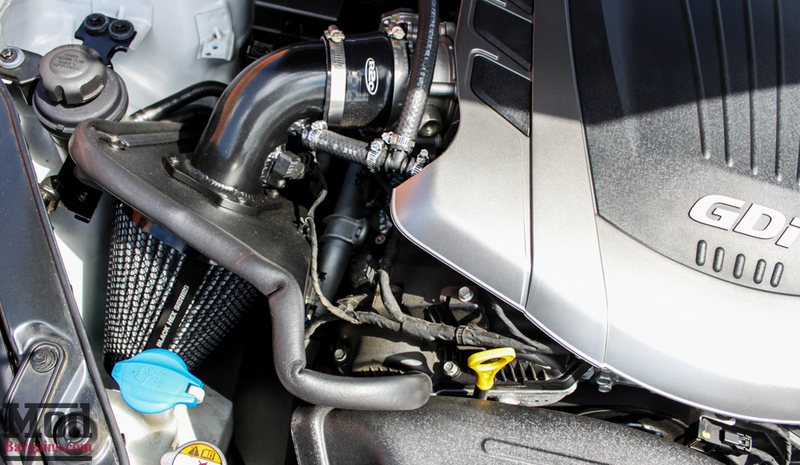 Note how the heat shield still is using the inlet from the OEM airbox to ensure it’s still getting fresh air through the duct. And of course, we recorded a short clip so you could hear the sound for yourself. We hope you enjoyed the photos and video! 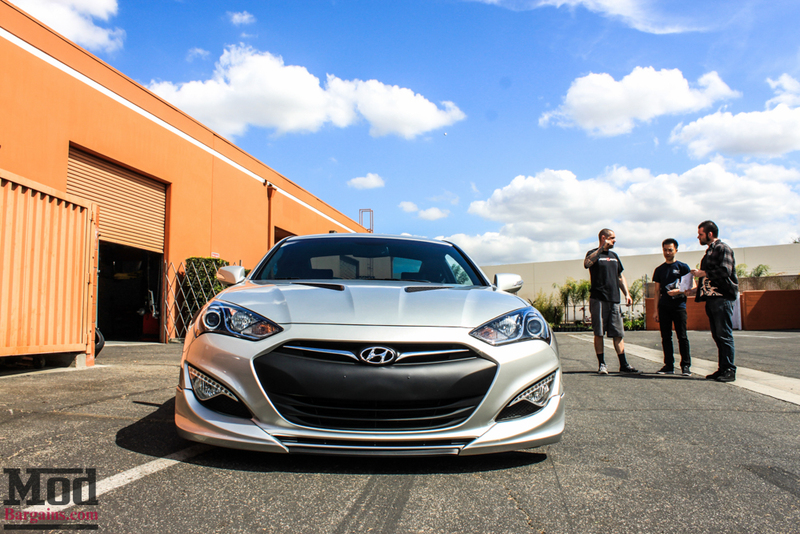 Interested in modding your Genesis Coupe? 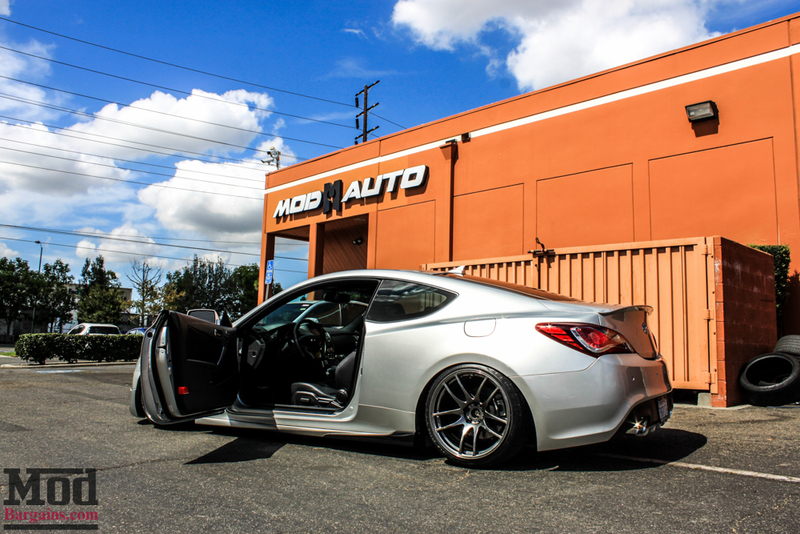 Check out our Bolt On mods for GenCoupe 2.0T here! Need something installed? 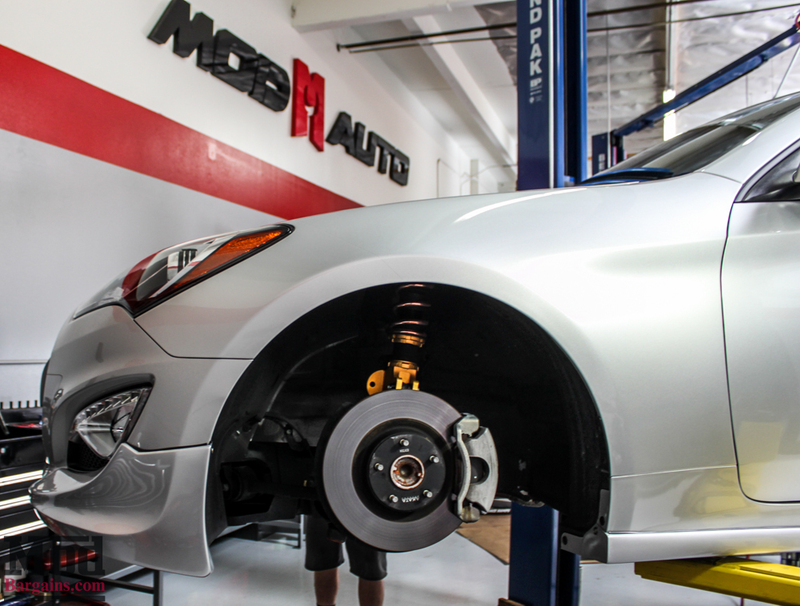 Click here to make an appointment, or just Talk to the Mod Experts, give us a call at 714-582-3330 to chat with our team of experts or stop by the ModAuto showroom in La Habra CA during business hours (8-5 M-Sat) and talk to our experts in person. 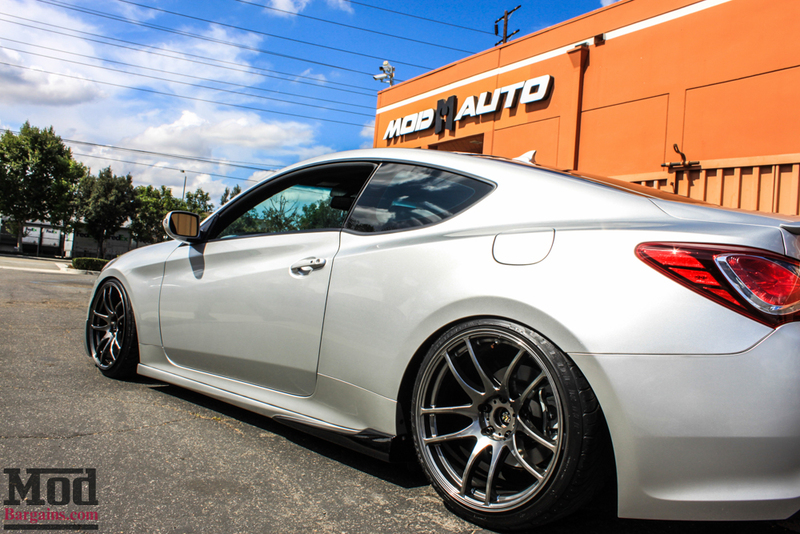 Sport Springs, Coilovers & Air Bags, Oh My! 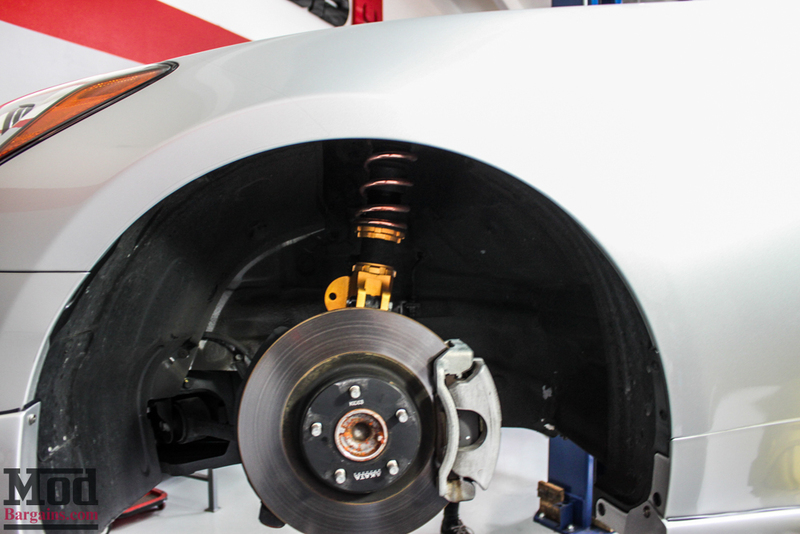 Which Suspension Setup Is Best For Your Car?